ATLANTA, Georgia (CNN) -- One of the Hummers CNN used to cover the war in Iraq returned Thursday to the news agency's headquarters after it underwent a major renovation on The Learning Channel. As a part of the TLC show "Overhaulin'," crews transformed the Hummer, nicknamed "Warrior One," in one week. They replaced the engine, raised the body of the vehicle and air brushed images of correspondents and troops onto the Hummer's champagne-colored sides. They also added a DVD player, four televisions and a state-of-the-art sound system. TLC unveiled the revamped Hummer in front of a swarm of fans, media and CNN employees. The episode airs again November 21 and December 21 on TLC at 8 p.m. ET. "It's great to see it like this," Michael Holmes, an anchor for CNN International, said as he peered into the clean leather interior of the vehicle. Holmes said he remembered arriving in Baghdad, seeing the Hummer, and knowing that the other CNN crew members there were safe. Shortly before his arrival, the CNN crew, the Hummer and the Marine unit they were embedded with had come under heavy fire. "I arrived around the day they pulled down the statue," Holmes said, referring to April 9, 2003, the day coalition forces took that war-torn Iraqi city. To celebrate, Iraqis and U.S. Marines toppled a massive statue of Saddam Hussein in Firdos Square. That day was also when the CNN and the Marine unit came under heavy fire. "I remember going around the square there and going back to the hotel where we were all mustering, and seeing the vehicle ... all muddy." He pointed to the back right seat where he said he sat while covering the war. "It's a nice memory," he said of his many experiences in Iraq. "There was a different motivation behind this project," Chris Jacobs, co-host of "Overhaulin'," said. "We wanted to commemorate the journalists who risked their lives, and in some cases, gave their lives to tell the story of the war." Warrior One will tour military bases and other sites across the country, before it is auctioned in January by Barrett-Jackson Auction Co. CNN will donate the proceeds from the auction to the Fisher House Foundation, an organization that provides temporary residence for families of patients receiving major medical care at military and Veterans Administration centers. The Fisher House has taken care for injured military one step further, said Dr. Sanjay Gupta, CNN's medical correspondent. "They've got these houses all over the country. And it's a pretty remarkable foundation." "We feel the Fisher House -- with its mission to support military families during times of medical need -- is an ideal recipient for the proceeds raised by the auction," Jim Walton, president of CNN Worldwide, said in a press release. The Fisher House Foundation operates 35 houses in 16 states, as well as one in Germany. 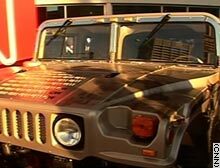 The revamped Hummer has air brushed images of journalists and military personnel on its exterior.